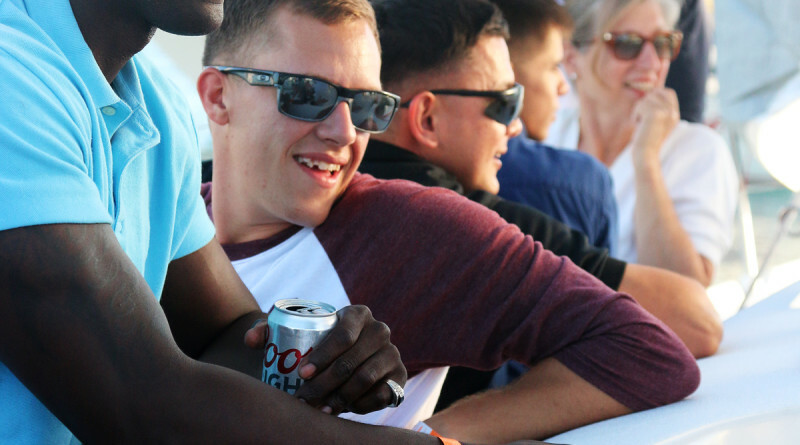 NEWPORT BEACH — Twenty-two Marines and sailors from 1st Battalion, 1st Marines (‘First of the First’) were guests of Balboa Yacht Club for an evening of racing during the club’s Thursday Beer Can Races on Aug. 27. Balboa YC, under the direction of club members Bill Frederickson and Art Mitchell, sponsored this event for the past five years; the city of Newport Beach adopted the Battalion in 2003. 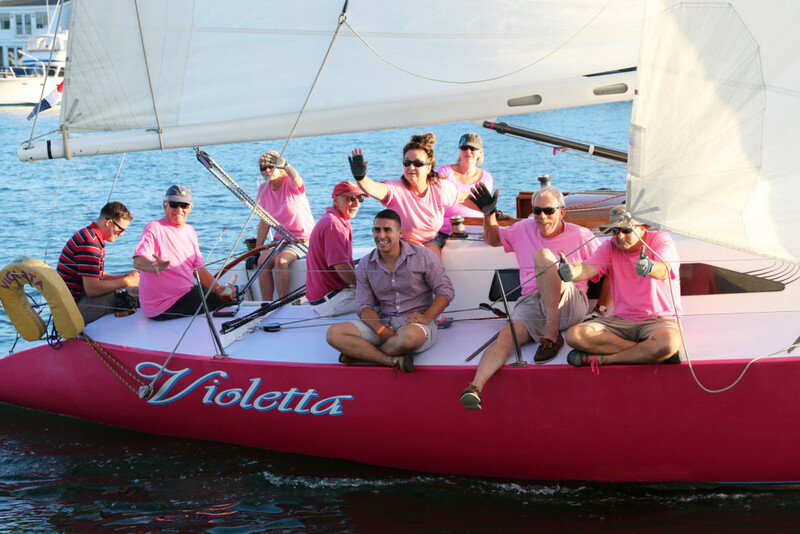 Violettas crew waves to race spectators. Longpre photos. The young men were assigned to assist five different racing yachts as crew and enjoy an evening on the bay. Most of these young Marines will soon depart from Camp Pendleton for Okinawa, Japan and Darwin, Australia for further training. “This is a fun and looked forward to event for these young Marines each year,” said Sgt. Riley Elmore of Alabama. Light winds prevailed, which made for a comfortable race from bottom of Newport Harbor to top and back. 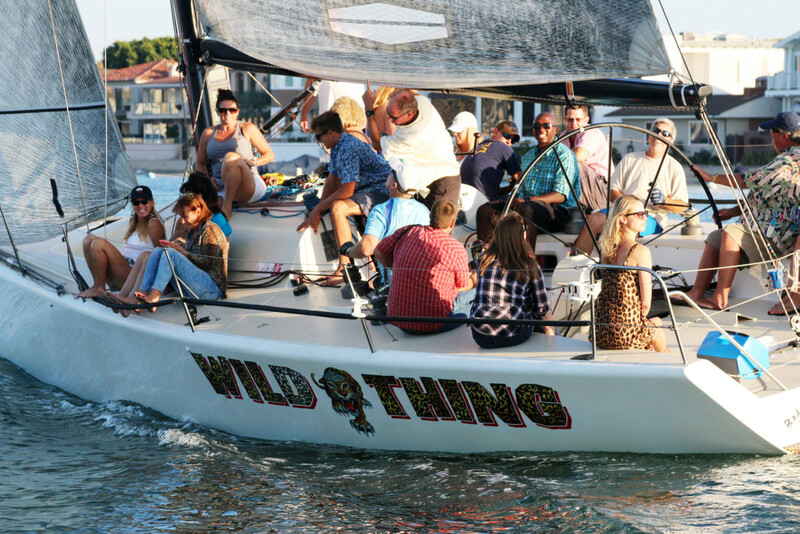 The winning boat in PHRF 1, Wild Thing, a Farr 40 owned and sailed by Rhonda Tolar, had Marines aboard. The win added to excitement of the day. Mayor Edward Selich, and his wife attended this year’s event. He spoke to the Marines and sailors and thanked them for their service and all they do for us. A barbeque dinner was provided after racing. The Marines joined the other racers and members on the Flag Deck for a relaxed evening before returning to Camp Pendleton.